Share Your Passion and Excitement for Space Exploration with Others in the General Public Through Educational Outreach Presentations. Humanity is no longer limited to the Earth’s surface and its limited resources! Our solar system has abundant energy, and material resources, millions of times more than on the surface of the Earth. The future of humanity will be enhanced as it uses the bountiful resources in space. Become a Space Ambassador and do your part toward making that happen by informing people about its value and encouraging their support and involvement. What is a Space Ambassador? What was Space Ambassadors Phase I? Phase 1 of the program had approximately 900 Space Ambassadors from approximately 150 nations delivering presentations to more than 31,000 people. For more information about the Phase I winners and sponsors, see the summary of the original program. What does a Space Ambassador do? A Space Ambassador is required to make at least two presentations a year to educate the general public on space related subjects. These presentations must complement NSS’s goals and meet general proficiency and ethical standards. Being a Space Ambassador requires personal interaction with people in a real-time environment. Just having a website or handling blog communications online is not enough. Although this is not specifically an engineering project, it does address engineering and scientific subjects as a part of explaining current space exploration activities and findings to the public. Why should I be a Space Ambassador? Becoming an NSS Space Ambassador empowers you to educate and motivate young people and adults to knowledgably discuss and participate in supporting space exploration programs. The Space Ambassadors team will give you any guidance or resources you need to enhance your presentation skills and engender interest in human space exploration and settlement. In addition to the personal growth and satisfaction you will enjoy, you will have the exciting opportunity to interact with space industry professionals and attend ISDC conferences. How can I become a Space Ambassador? Your next step will be to fill out the Space Ambassadors Program Application Form. What resources are provided to Space Ambassadors? 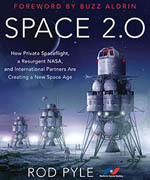 In acquiring materials for preparing your presentations, the content on SPACE.NSS.ORG is an excellent place to start – primarily located in the Our Future in Space section. In addition, the program offers the following example presentations to serve as a source of ideas. 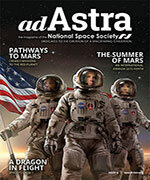 How do I become a Space Ambassador Program Sponsor? If your company is involved in space projects, you can support the NSS Space Ambassadors program by supplying information (in written or video format) about your products/services and by encouraging your employees to become Space Ambassadors. Please contact us if you would like to provide awards for outstanding Space Ambassadors; these might include a tour of your facilities, a private meeting during an ISDC conference, or merchandise with your company logo. Please use the Space Ambassadors Program Contact Form to have your questions delivered to the program’s director – Stevan Akerley.